Guitar Chord Theory - The Crash Course! This series of guitar chord theory lessons will give you a crash course in how chords are constructed. I've spent a lot of time refining and condensing this course so you only learn what you really need to know. Guitarists often learn chords by using chord charts, which is fine for knowing where to put your fingers, but it's also beneficial to understand what's happening "behind the scenes", the mechanics of why chords sound the way they do. That way, you'll be able to get exactly the sound you want from your music. However, in my opinion, the main practical benefit of learning chord theory is that you'll see a clearer connection between scales and chords, as they're both made from the same building blocks (intervals). 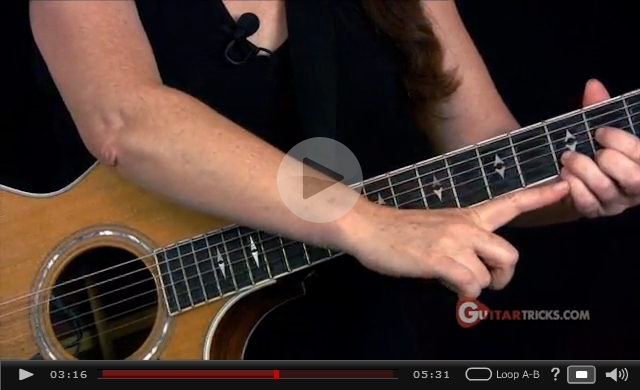 You'll be able to hear a chord and know exactly which notes to target in a soloing phrase. That's why, when guitarists ask me "how do I apply scales over chords? ", the first piece of advice I offer them is to "learn chord theory!". The bottom line is, this course will cut your improvised "trial and error" time in half, so you can focus more of your time on making music that sounds good. Note that guitar chord theory is not for beginners! You need to at least have a basic understanding of intervals. A chord is a type of musical structure, built from 3 or more notes. For example, C major contains the notes C, E and G.
C, E and G are therefore the building blocks of the C major chord. 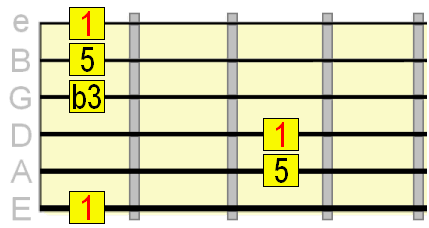 A chord can be built by first selecting the 1 note. This is called the root note as it is the 1st note in the scale. You could see this as the foundations of the chord structure. We then select two or more additional intervals from the scale (e.g. the 3 and 5) and build them on the root note to create the chord (so in our example we'd have 1 3 5). Click to hear 1 3 5 played as a chord - listen closely, I use three root notes - G, E and C#. Notice how each chord has exactly the same quality, we're just playing the 3 and 5 in relation to different root notes. The root (sometimes abbreviated as R) is always the reference note when writing a chord, so when you see Gmaj, Gm or G7, you'll know the root note is G.
Emaj, Em or E7, you'll know the root is E.
C#maj, C#m or C#7, you'll know the root is... yep, C#. It's the different combinations of intervals stacked above that root note that give us the different chord types. We'll be looking at some of the most common chord types throughout the series. 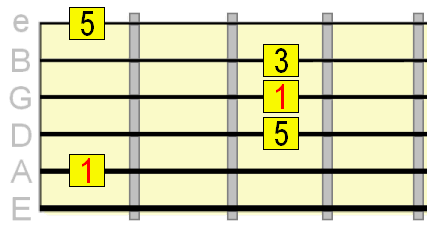 A major triad consists of a major 3rd (3) and perfect 5th (5) above the root (1). These intervals make up a major chord in its simplest form. 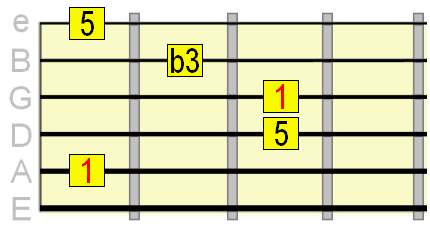 The root (1) is always the note by which the chord is referenced (letters A through to G). For example, G major is so-called because its root note lies on G. We can abbreviate this chord as G or Gmaj. E major would be abbreviated E or Emaj. C# major would be abbreviated C# or C#maj. As you can see, all the notes of the major triad are included in the chord form. We could play from the low E 6th string, the A string (the root doesn't have to be the lowest sounding note in the chord! ), D string or G string, basically any set of strings that include the 1 3 5 triad structure. So again, we could play from the A string, D string or G string, as each would include the major triad. So, we learned the major triad was made up of the root, major 3rd and 5th. The minor triad is made up of the root, minor 3rd and 5th. The word "minor" in the context of a "minor chord" refers to the presence of the minor/flat 3rd. So technically it's that minor 3rd interval above the root which gives minor chords their sound. The 5th is neutral, which is why it's used in both major and minor chords. Think of it as adding more meat to the chord. 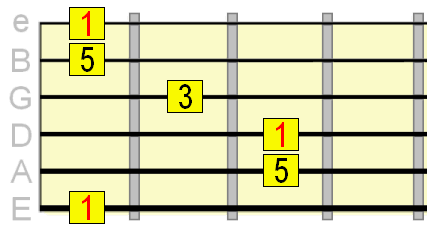 All that we change from major triads is flatten the 3rd a half step - in other words, move it down one fret. This gives us what is abbreviated as a ♭3 (a minor 3rd interval). See how that 3rd has been flattened/moved down 1 fret from its major 3rd interval? Remember, the letter used when writing chords is determined by the root note, so if the root was positioned on the note B, the chord would be B minor (Bmin or Bm for short). Suspended (abbreviated as "sus") chords refer to any chord that does not contain a major or minor 3rd. This means suspended chords are neither major nor minor, as the 3rd is responsible for making a chord major or minor. That's a suspended 4th chord and would be written as Bsus4 if, for example, the root note was B. When playing these chords, try and internalise their sound. What mood do they convey? You can also have suspended 2nd (e.g. Bsus2. Csus2) chords where the 3rd is omitted and a major 2nd interval is used instead. Just think of "suspended" or "sus" as meaning "no 3rd". This means suspended chords are neither major nor minor. In guitar chord theory, whenever the 3rd is not part of the chord, you effectively have a major/minor neutral sound. Incidentally, that means both major and minor scales will work over them. You can learn more about suspended guitar chords here. So we've covered how the basic major, minor and suspended chords are constructed. You may not realise, but countless hit songs exclusively use the three chord types we've studied on this page! Go back and review this lesson if you need before moving onto the next part. And remember, learning guitar chord theory is so much easier once you know the fretboard.